And another post of the selection process for arriving at 50 items in each category; An Exhibit Takes Shape: Final Decisions for 250 in 250. See Directions to Tesson Ferry library for map showing library location. 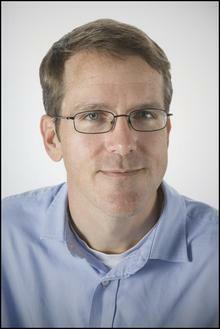 This presentation is sponsored jointly by Tesson Ferry library and Sappington-Concord Historical Society. 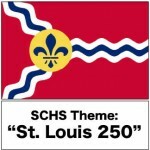 This event is part of the SCHS programing theme, St. Louis 250. See St Louis 250 to learn more. For other SCHS themes, see the Themes page. 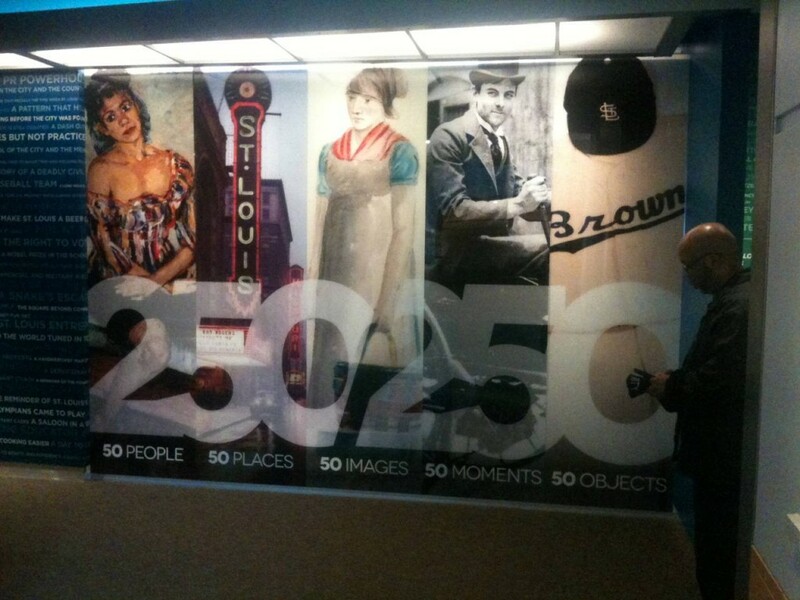 The photo below shows the entrance to the exhibit, “250 in 250,” now showing at the Missouri History Museum. The photos below are some of the 50 objects in the “250 in 250” exhibition. The photos were posted on the Missouri History Museum Pinterest page along with more information about each object. To get more info about any of the objects, go to Missouri History Museum Pinterest page. Missouri History Museum exhibition for the 250th anniversary of the founding of St. Louis, MO. Photos from: http://www.pinterest.com/mohistorymuseum/st-louis-turns-250/ Director of Exhibitions and Research having fun with Step Inside Historic St. Louis! Rasmussen family baby sitting in an outdoor washtub. Three juniors clown around on campus at Washington University. “Junior Class, ’93. Washington University,” ca. 1893. Pruitt-Igoe as it looked in February 1955. Annie Malone, the country’s first African American millionaire, and William Carr Lane, St. Louis’s first mayor. Female Hospital, formerly known as the Social Evils Hospital, where prostitutes went for medical inspections when prostitution was legal in St. Louis in the 1870s. Candidates for the People section of the Missouri History Museum’s 250 in 250 exhibit. From top: William Clark, Dred Scott, Susan Blow, Charles Lindbergh, Annie Malone, and Stan Musial. Katherine Dunham dress worn in her 1952 performance in Acaraje. This elaborate mantelpiece was designed and made by Anna Sneed Cairns in the early 1880s to be installed in Kirkwood Seminary and Forest Park University. Owl pictograph of the Mississippian mound people, ca. 700–900 CE. Jim Delsing’s St. Louis Browns uniform from 1952. Stone human effigy from the Mississippian mound people, ca. 1300s. To see the rest of the 50 objects and to see the 50 people, 50 places, 50 moments and 50 images, you have to actually go to this free exhibit in person. It is well worth the effort. If you can wait until April, the SCHS is going to see the exhibit as one of its Meet-at-the-Sites tours. But probably you will want to go now and go again in April! To learn more about the exhibit, see the Missouri History Museum website. To hear about the curation of the exhibit, the thoughts and choices that went into deciding how to tell the story of 250 years of St. Louis history, come to the daytime presentation on Friday, February 21st at 2:00 pm at Tesson Ferry library. The presentation is free and open to the public. More info on the Tesson Ferry library. …join us and we’ll make history together! Sappington-Concord Historical Society proudly serving the area of the Lindbergh Schools in South St. Louis County, Missouri, USA for 25 plus years. SCHS serving the greater community of the Lindbergh Schools. The World War II Honor Roll at Sappington-Concord Memorial Park.